Fermentation cabinet protects the humidity and temperature which exists in the room due to using climator unit and moisturizing equipment. For observing the fermentation, a window added on the cabinet door. 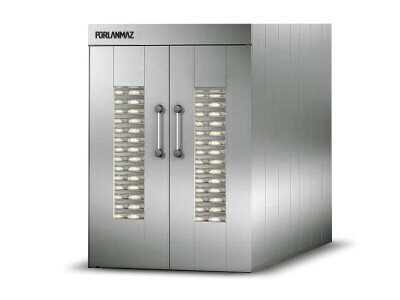 This final fermentation cabinet is necessary for the fermentation process of the dough. The dough which is divided for making bread should be kept inside this cabinet and required heat and humidity must be supplied in to fermentation cabinet. It is made of stainless steel or PVC covered material which gives hygienic environment for dough. For observing the fermentation, a window added on the cabinet door. The humid and heat inside the cabinet can be seen and controlled on control box. * On request it is produced for 6, 8, 10, 12 trolley.